Looking for information on paintball guns and locations? Paintball is a sport that has exploded in popularity over the years. It is a great way for a person or a group of individuals to get exercise and have fun doing it. Often a lot of emphasis is placed into the selecting of the gear that a player will wear while the subject of paintball guns can be overlooked. There are a number of these items on the market that can deliver the results you are looking for. One thing to keep in mind when dealing with paintball guns is to buy automatic or semi-automatic? The decision is a tough one to make as it really comes down to a personal choice; there are advantages as well as disadvantages to both. The decision will have to be one that you will need to make based on your personal preference. Most people will however prefer to have the automatic as it allows for faster fire without you reloading. The key when selecting paintball guns is to see how it feels when you are in a game of paintball. While you can’t give it a tryout before you make a purchase decision, you will get a decent idea as to how this will feel while playing paintball. By playing at Action Packed Paintball you are able to rent a gun from us, which maybe give you a good idea of what you like and don?t like. 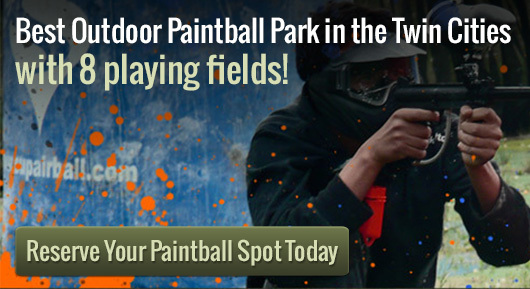 Walk on play and private play is available at Action Packed Paintball. We can accommodate groups as large as 150+. We are capable of running private games 7 days a week, dawn until dusk. Please call us at 952-492-6776 if you have any questions or if you would like to reserve a time. Please call ahead in advance as reservations are required.